It’s likely that most folks reading this blog – and certainly the folks who post here regularly – are pretty sure that the costs of further economic growth, in a global sense, have begun to outweigh the benefits. And, ecological limits aside, a good portion of those costs have to do with how we – the readers and writers of this blog – experience happiness and satisfaction in our own lives. Whether it’s the shallow rush of consumption, the seductions of advertising, or working overtime beneath the fluorescent glare of office lights, we’re mostly in agreement that chasing material rewards at all costs is a dead end. But it’s a big world out there. We are not everyone. Many of my good friends and family members truly enjoy shopping, dream of big bank accounts, and genuinely love the fact that they can choose between 500 sports channels on their new hi-def TV screens. Or so they tell me. So, Post Growthers: What’s our response? These, to me, are all tough points to argue with. They make a clean logic. And I certainly don’t believe that I, or anyone else, should be telling other people what makes them happy. But! What comes first: personal freedom or the Earth? Physics and chemistry win the day on that one, I’m afraid. But do we have to choose between the two? The question really is: how can we all get on board – in some expression or another – with a way of life that fits within ecological limits? Let me be more specific: How can we reconcile a healthy respect for personal freedoms with the intuitively valid argument that further economic growth (in the West, at least) isn’t making us any happier? A couple suggestions. One: A good place to start is with getting our accounting straight. That seems a clear way forward and doesn’t impinge on anyone’s ability to decide for themselves what amounts to happiness. Money spent on hospital visits and new prisons aren’t positives on anyone’s balance sheet. Two: Provide full information and real prices. If buying that new LCD screen means a girl in China is working a 16 hour day and coming home with heavy metals in her system, that (at the very least) needs to be both clear and – this bit is controversial – priced into the product somehow. Three: Lead by example. If trading consumerism for organizing a neighborhood block party really makes you happier, then do it. And spread the joy – you’ll be a part of cultural change. The floor is open for debate. What say you, Internet? Image credits here and here. The basis of libertarian thought is the notion that your right to swing your arm ends where my nose begins. Even if it makes you happy to swing your arm every which way. If I was to invade your space, then we could debate whether I am in your space. But widespread awareness of climate since June 1988 means that whenever any of us drives our cars, we are in each other’s space. Carbon pollution creates a whole new paradigm. Every society believes in self-defense in the face of life threatening danger. And every society– many mammal ones, not just human– is devoted to protection of the young and the right to carry the species onward. If there was an acceptable alternative to degrowth, I’d advocate for it. We can have planned, civil degrowth, or we can have deeply painful degrowth (collapse). You raise a great question, and this letter writer in the New Yorker has a valid point. However, I think there is confusion in what exactly the happiness argument is about. There are means in which we enforce things that make us happy (we do this already with all sorts of stuff, usually how to not have “too much” fun). There are also means in which we allow for people to have access to fundamental sources of enabling the pursuit of happiness – which is assumed to be pleasure with the overall life lived, contentment, et cetera. Tim Jackson calls the latter the capability of flourishing. It is the job of our government to provide every citizen with the capability to flourish. Whether or not we choose to flourish is our own right, how we flourish is up to us as well. There are common grounds that we know will allow a human being to flourish in our society. Education, food, clean water, shelter, et cetera fall into this category. The ability for everyone to have these things should be provided in some way. A steady state policy of providing a minimum income would probably do the trick for some of these – the person decides how they want to meet those needs, if at all. That is their right, the how. It is our job to ensure not that a specific how is accomplished, but that there is an ability to ask that question in the first place. This is a oxymoronic argument. If we have laws that insure your pursuit does not impinge upon my pursuit, then we have already defined to some degree what that pursuit entails. We cannot flourish without life, so we outlaw murder. We prefer to flourish with our possessions, so we outlaw stealing. We like to consume alcohol, but we limit it’s intake to avoid too much consumption. Why not continue to define the means of happiness? We will surely be able to recognize what everyone needs to flourish, as well as the various things that are optional (possible requiring a different set of rules, support, et cetera). It is the ends of those means that we have personal freedoms in pursuing. The argument for happiness accounts, support through legislation, and subsidized capabilities of flourishing by the government is simple: why has our society be created? To pursue happiness – for everyone. Then let’s figure out what that means, and give everyone the capability to flourish. It seems to me that your question – personal freedom or the earth – is the wrong one, as you in fact suggest it might be. I think the problem here is the discourse and framing of freedom, in America especially, but also elsewhere. George Lakoff’s short “Don’t think of an elephant” is interesting on this point. Because the way we currently talk about and conceive of freedom sees any limit as an evil, and even an unavoidable limit as just a necessary evil (rather than a good), we assume that any attempt to challenge and change consumption patterns involve the limitation of freedom (bad), rather than its rediscovery. Lakoff’s famous example is “tax relief”, a framing (that the right managed to get the left to adopt) which implicitly references any attempt to increase taxation as a bad. Some of the Italian folks (Marco Deriu and others) at the Barcelona Degrowth conference were explicitly talking in these terms, around the need to frame an idea of “inclusive freedom” to avoid what the Greeks termed ‘hubris’ (arrogance). I agree with this line of thought – to me, the challenge is much more one of how we conceive of ourselves and our relationship with the world, rather than a matter of “getting the price signals right” as you suggest. Sure that an important part, but it’s only the mechanism. Without working to changing the collective framing and imagination around freedom (and other things), such mechanisms will fail in the political compromise. But what about the fact that people find shopping satisfying? Here I’d personally want to resist any suggestion that post-growthers as a group are that fundamentally different from others. Even though I’m critical of consumerism, certain things still get me excited – visiting an outdoor sports store or new cycling equipment, for example. I might be excited by different things (I’ve no interest in a flat screen TV) I think I experience consuming in fundamentally the same way as most people, and it’s not all bad! By the same token, however, I think that most people experience consuming in the same way I do. That is, most people in rich countries enjoy consuming but recognize its limits. Given the choice, a majority would rather work less rather than increase their income and consumption. As the first pages of ‘The Spirit Level’ show, most Americans simultaneously believe that society should move away from greed and excess, and that they are isolated in this view. 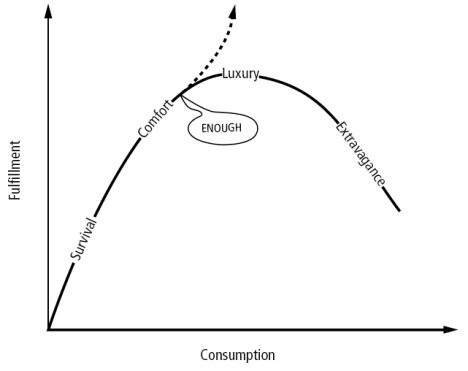 It’s also important that consumption involves a lot more than just the pleasure of buying a new TV. It also involves daily, unthinking habits (‘inconspicuous consumption’) which we didn’t in any sense choose, and which are often unsustainable and growth-driving. With the right freedom discourse, recognizing and changing these habits can be a liberating experience. It also involves the opposite in Veblen’s ‘conspicuous consumption’, which most people recognize as an ultimately pointless exercise even while we all continue to engage in it. I haven’t talked that much about happiness in this comment, but for me that’s a side point actually. The main point I’m trying to make is the need to refute the idea that we as post-growthers are different (and implicitly, better) and so realizing sustainability necessarily involves placing freedom-inhibiting restrictions on what other people can do to realize their happiness. For me, this is a project about rediscovering commonalities and ourselves, and also seeing that realizing our individual happiness is about much more than our individual preferences and choices. You’ve raised an important point here, Scott – who is anyone to decide what makes others happy? There is absolutely a plurality of views out there, and I agree this is a tricky path for anyone to go down. I don’t think there is anyone who does not find it pleasurable to buy and have things, have a comfortable material standard of living, to be able to give to others, and to express part of our identity through our material things. The trick is to identify what is ‘enough’ – where consumption stops being pleasurable, and starts being a pain in terms of debt accrued, or the time ’stuff’ siphons from your life in managing it. I personally like new things, I like stuff – and it is entirely likely we are either hardwired biologically or ’softwired’ through culture to be like this. Now we have to break our programming and be mindful of what the cult of stuff means for the world and other people. Having said that, many religious and spiritual traditions [and common sense!] speaks of the foolishness of seeking happiness through material wellbeing [of course attaining a certain level does indeed contribute to wellbeing and happiness]. It would also be fair to say that we have a marketing industry that is constantly manipulating us in terms of what we think makes us happy, so perhaps we do need some affirmative action! I believe there is a case for intervention by the state in some situations. The ’state’ [no, its not a Communist word!!] is shorthand for the social contract – we all come together to live under a jurisdiction because it makes life easier for us all. We don’t all have to grow our own food, provide our own security and be skilled to run our own health services. So if you choose to be part of the social contract, that comes with a balance of rights AND RESPONSIBILITIES to others in that contract. Its NOT your inalienable right to consume as much crap as you want to because that is your preference when you are going to create a major burden on the public health system. The state can and does run public health campaigns about food, smoking, drink driving that seek to influence others to curtail their individual freedom for the sake of others – maybe the same kind of campaign about over-consumption is not so different? I think the answer lies in asking questions rather than dictating solutions – people who come to their own conclusions own their decisions and their values. When Jamie Oliver was talking to Oprah about how to bring about change – and what people put in their mouths is such a personal space to get into, it is very difficult – he said that ‘humans are creatures of habit, and ‘…people don’t want to change until the pain of staying the way they are gets worse than change…’. Acknowledging biophysical limits is a pretty painful thing for a lot of people, because it suggests that we will have to individually and collectively change what we do. In ‘On Liberty’, John Stuart Mill defined ‘freedom’ as ‘freedom from’ and ‘freedom to’. Maybe the time of our individual ‘freedom to’ consume as much as we can and define our happiness in terms of material things is about to clash with our collective need for the ‘freedom from’ ecological collapse, social breakdown and the mental, physical and emotional health impacts associated with overconsumption. Wow. Thanks to all for the thoughtful and intelligent comments! A great discussion shaping up here. For me, here’s the question your comment seems to lead to: Does a libertarian philosophy – interpreted in the way the letter does – hold any validity in the context of sustainability? Just asking that question feels incendiary! Maybe because I’m a big believer in the right to believe whatever you like. But it seems to me that the “spatial” context of libertarianism – that we each own enough space to swing our arms – no longer holds. Overshoot and a population converging on 9 billion means we’re all closer together; we all have a smaller bit of ecological “space” to operate. What does that mean politically? Is a “sustainable libertarianism” possible? If it is, it could do wonders for making real action politically do-able, now, in the US. A libertarian ethic of some shade or another runs deep in America, and I’d argue influences our politics no matter where you sit along the right/left spectrum. Paul: I agree. The language you use has so much more breadth and life to it than “getting the prices right.” Seems like you’re talking about changing what Sharon has a cool name for: our “softwiring” – in other words, cultural change. I’m starting to feel like the most interesting changes that’ll happen around sustainability won’t be specific policies, but cultural memes and value shifts. Seems like changing the culture gets around the problem of government finger-wagging about happiness: if you’re embedded in a culture that casts a wary eye on consumption and celebrates neighborliness, chances are you will too. All this reminds me of what often happens in small communities – where you’re more likely to help a guy out simply because you know him. The social contract at work? Joshua: I hear what you’re saying. But I think even the hardest line libertarian would accept some limiting of his freedom by the government – outlawing murder is the extreme example. So is it really just a matter of shades of gv’t intervention? E.g. libertarians want least possible, liberals are in the other direction? I also agree, in a big way, that ensuring happiness is about providing capacities to thrive rather than outlining specific ways of doing so. How can we make sure we’re leaving the door open to all, but not dictating how to walk through it? The next question might be getting concrete about how those capacities are provided. Minimum incomes? Tobin tax? Nat’l healthcare? Let’s think more about this – will be key to putting together a vivid postgrowth vision, I think. Great comments, all. Any other thoughts? Curious to see where this goes. It’s now bedtime here in the States!